Andres Segovia had given the key to open the door to mastering good tremolo when he said : "Tremolo is an arpeggio on one string". Practicing various arpeggio studies is a start at achieving the necessary speed and coordination to master thistechnique. Use your fingers in the following order : p,a,m,i with various rithmic accents on p or a or n.
Tremolo is one of the most impressive effects of the classical guitar when executed precisely and quicly. To get this it is needed a lot of practice and dayly application. The followings area easy left hand exercices aiming at do not distract the player as his attention must be kept to the right hand. The real and proper tremolo is the following exercice no.1, the others ones rapresent various combinations with others right hand fingers : this is usefull for balancing finger strenght, pulsation and right hand fingers indipendence. Let's play exercice no.1, then play exercice no.2, then no.1 again, then go to exercice no.3, and again exercices no.1, finally play exercice no.4 : now you'll find out exercice no.1 is easier to play. It's better to play this exercices slowly, impressing the same strenght to all your right hand fingers and playing notes all with the same lasting value. 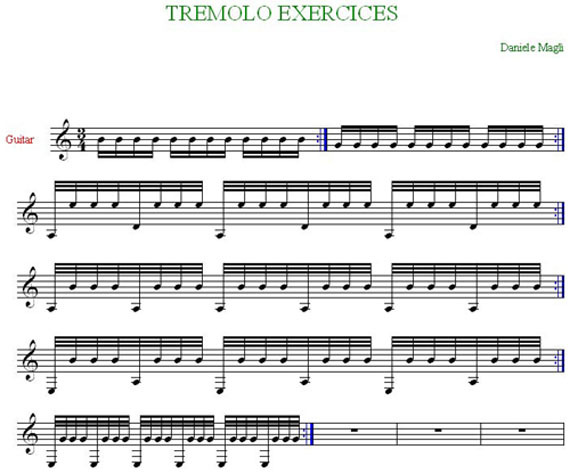 Now you can learn a modern tremolo composed by Daniele Magli, here you can watch the video and download the free .pdf score. I'd suggest you to learn a few measures at a time and to be patience and to be helped by a metronome.